My Mystery Medallion Challenge Block One is completed. I would like to say it was a breeze. It should have been but my fears...and stubbornness lead me to having to recut pieces from the limited amount of fabric I have.. 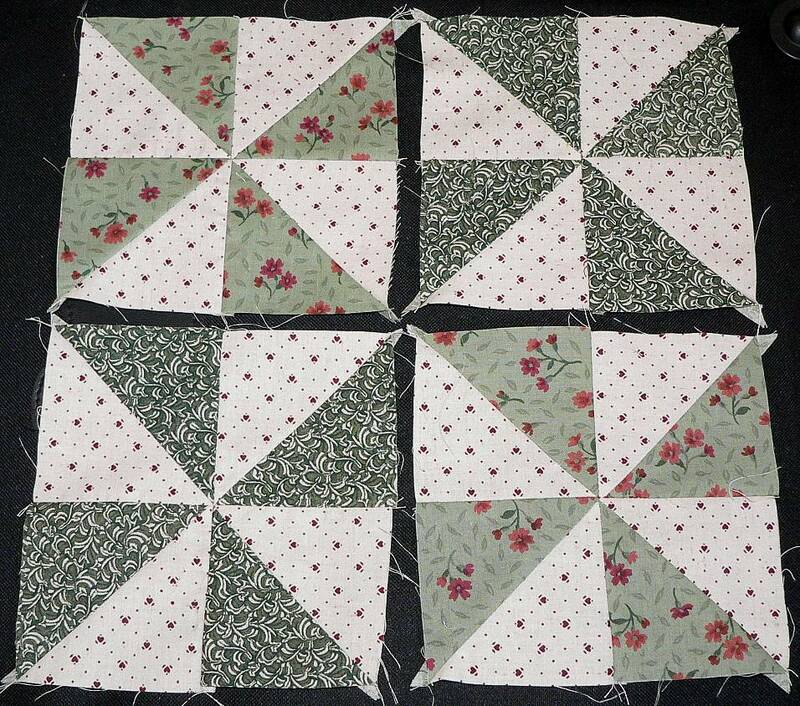 I am terrified of bias edges, I have made flying geese one way my whole quilting life....that is using a square on the rectangle. In the process I get to harvest 1/2 square units. 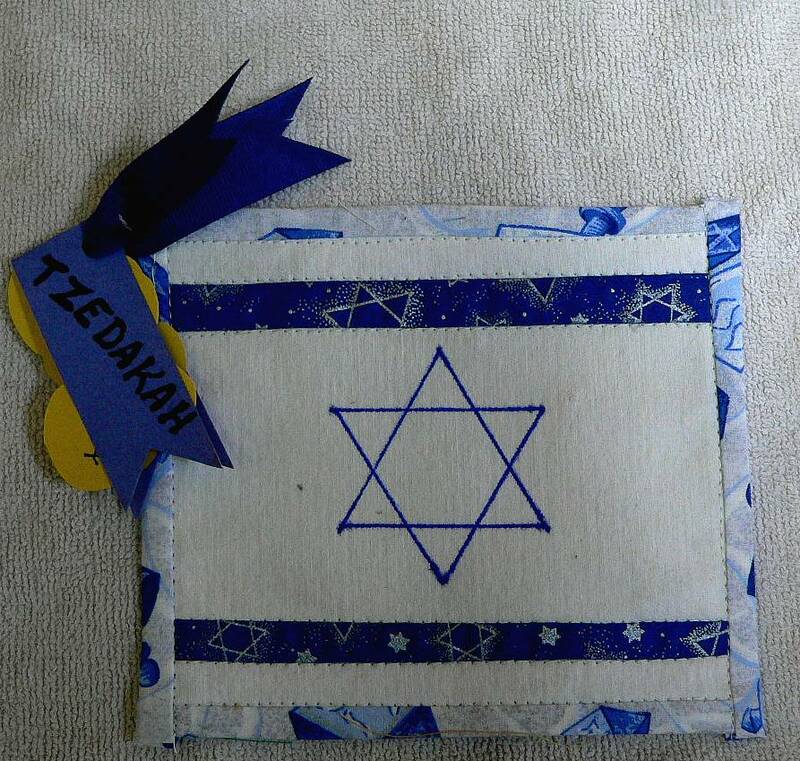 Toby's instructions tell you to take these wonderful 8 3/4" squares and diagonally slice them ...not once but twice...to me that was sacreligious....I stopped reading and cut my rectangles the correct size with the squares the correct size, and proceeded to piece the flying geese. These are the pinwheels I harvested from not following the instructions. Toby does say in the directions at the beginning of this mystery, "read the instructions all the way through before beginning". 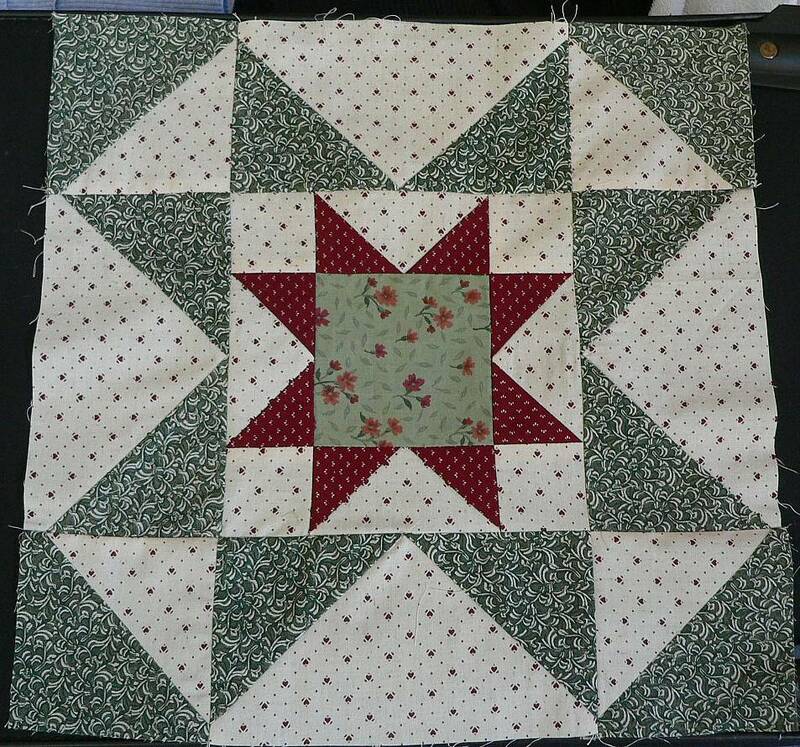 No disrespect to Toby, I just had my mind set that I was going to get by without sewing bias edges...and be able to harvest my 1/2 squares..Talk about bull headedness! 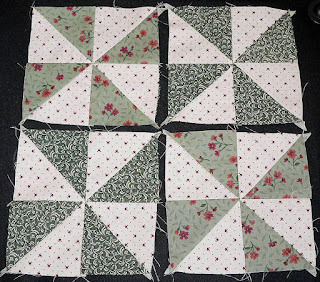 When I continued piecing the rest of the geese..I discovered it was a necessity to cut those 8"squares and struggle through the bias edges. Toby designed the piecing so the bias edges didn't end up on the outside edge of the unit. Sewing the bias edge on the side of the geese was not difficult. I made sure I placed the bias piece on top of the nice stable piece. Then I made sure the pressure on the presser foot was set on low so the seam was not stretched out of shape. I am no longer biased against sewing on the bias. Thanks Toby for this very fun "free" adventure. Thank you for making me indure a part of piecing till I was no longer afraid of it. BTW Toby....paper piecing is still torture for me. 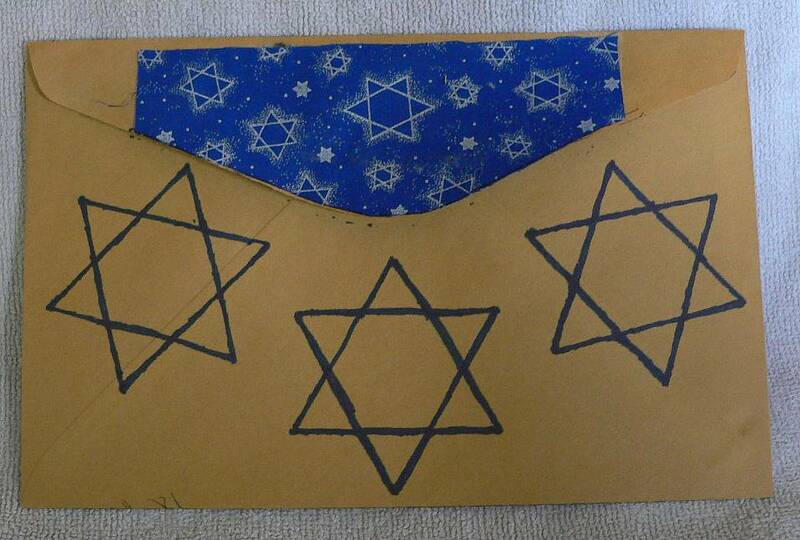 Everyone...Toby has a paper piecing way she says is foolproof...Hmmm.........wonder if it is Gloria proof? Looking forward to this Friday!!! Second clue!! and a blog about my most embarrassing moment. A "Soap box" blog where I do air my opinions. who has become a hidden treasure. All recipes, pictures, and writings are my own. I give credit for items which belong to other people in my blogs . If you are unfamiliar with this internet challenge I hope you will see why I am here. 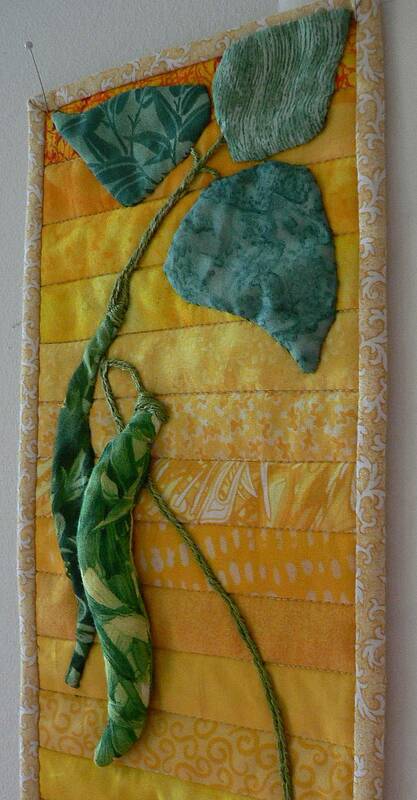 The following link is your passport to quilting...(at least I hope this is the right link). The first thing you do when beginning a mystery quilt is to pick your fabrics using the list of requirements. For me, this time was more difficult than normal. I am unable to get to my stash so I had to use what fabric was already at hand. (I won't order online...I am one of those people who has to feel and see. I don't trust my monitor's colors.) On the left are the fabrics I have chosen. I only had enough yardages to do the lap size version. This is another thing in mysteries. you are able to choose the size of project you want to work on. A date is set when you'll receive your instructions. It can be monthly or weekly. When you get your instructions read them through ...top to bottom ...before you cut your first piece of fabric. This is the results of the first installment on the mystery. I made two versions of the first part because I was unsure which fabrics I wanted in the center of the block. My two greens are very close in value. I chose this block because of the light flowery feel. The one above will be a pillow sham to go with the quilt. When I began construction of this first part I knew I wanted to harvest 1/2 squares from the flying geese. Toby's instructions do not include the method the squares. With a little extra stitching, and time, you’ll have a pieced unit to use in another project,salvaging fabric which would normally be wasted. Stitch 1/2” away from your previously stitched seam: then press the triangle back to the “ outer point”. Pressing back to the corner is very important to do before you trim between the two seam lines. 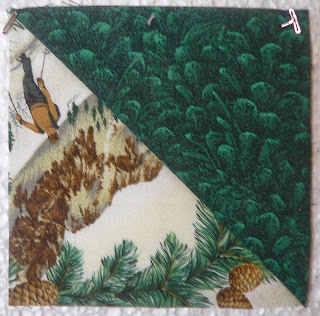 Stitching ½” away results in a bonus ½ Square triangle. Be careful when you trim the half square triangle off(cutting between the two seam lines) that you don't cut your triangle off the front of your unit. Press your HALF SQUARE TRIANGLE open to the dark fabric. 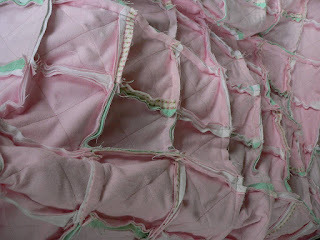 Voila, a bonus unit to use in another project, Fabric rescued before it be comes trash. These are the harvested 1/2 squares from part 1 of block one. I have made them into wheel blocks. The red ones will be 2 inches when trimmed and the green ones will be 5 1/2 inches when trimmed. Now I have some orphaned blocks instead of trash fabric. The designers blog: This is about the first part of the mystery with techniques for successful piecing of the bloc...and the flying geese units. I am headed to work on Part two ! It's been quite a long time since I have made a post to my blog, much less a creative one. Right now I am stuck using what I have at hand. Scraps, recycled items , fabric which was already upstairs. I am unable to get to my stash. Actually it has been a blessing. I have learned use it...to the fullest extent...make do with what you have. 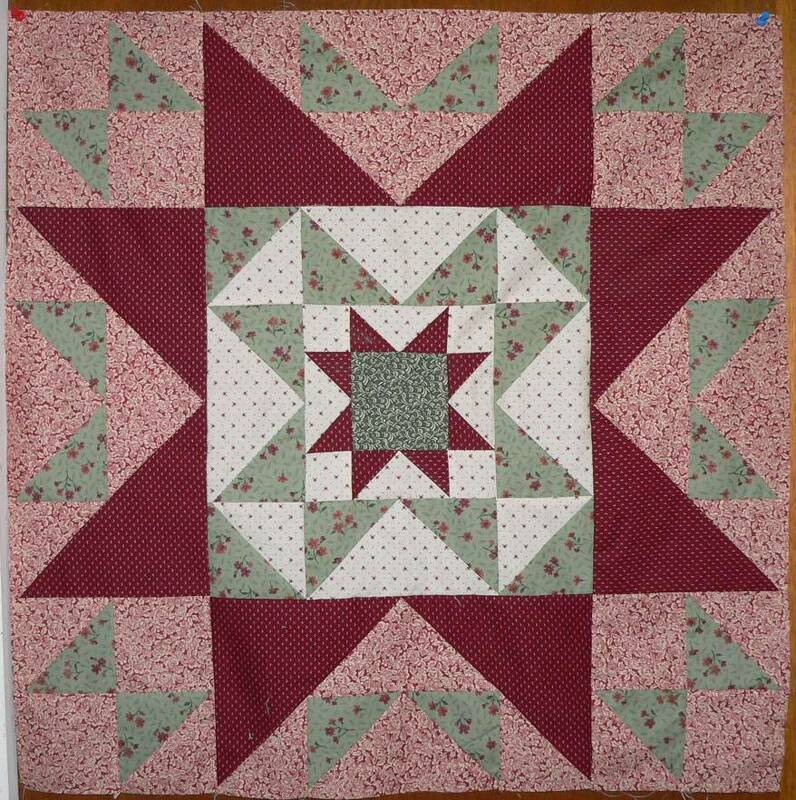 (I had 3 quilt tops evolve from a box of scraps). Last week the buzz on FB was about having sisters, celebrating being sisters. My sisters and I are spread all over the United states. I am mid west, I have one in the great lakes, and one in Florida and one in the Rockies. We have totally different lifestyles but underneath we are all the same. We are creative talented people with compassion for everyone. How do I say it? it needs more than a phone call? Phone calls are menial things. Recycle/re-use to the rescue. I buy items because the container appeals to me...the contents have to be needed too, but I bought that variety because of the container! netting from an avocado bag. from the 70's pieces of fabric too small to even save. The last of a polka dotted fabric from the 40's. The sewing machine and any old thread...this isn't a love it for two life times project. If I'd Given it more thought I would have used some of those color catchers in the project. Remember this is a fl by the seat of your pants project..just doing not planning. The following are the cards I made to send to my sisters to remind them they are not out of my thoughts no matter how far away they are...and for a full day they were the only thoughts I had on my mind. This sister was born a star. 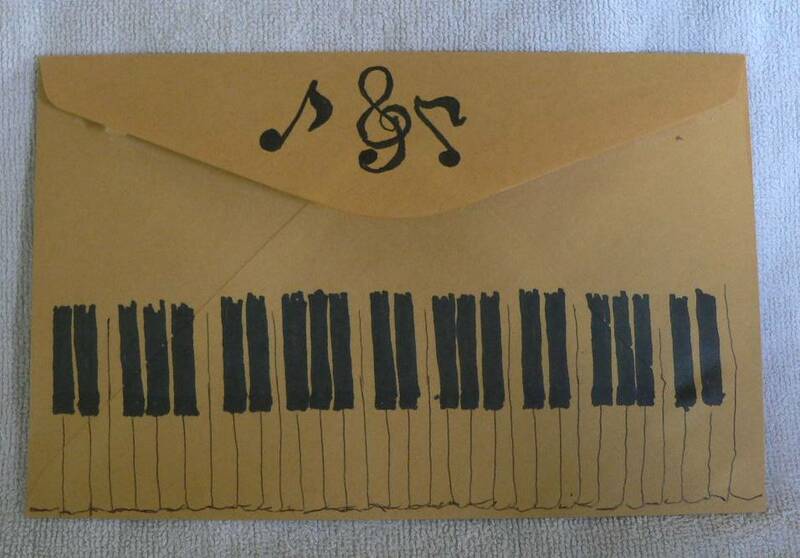 She plays the piano and sings, is an Actress and is very active in leading her community through the music world. This is her card, constructed of scraps on the dryer sheet. she has the 40's fabric. ready to snare "Nemo" if he gets careless. Here is the envy to send it to its destination. The white fabric is the old painters jeans from the 70's using the scraps I had to frame it and make and Israeli flag. Luckily in the back of the drawer I had a blue sharpie. I never use blue...but sure glad it was there. The envy isn't fancy, but it was fun thinking and creating mementoes for my sisters. They may or may not keep them, but they will know this day when the internet was abuzz with sisterly stuff, they were on my mind, I was wishing we could sit down together and enjoy the laughter which goes with being sisters. 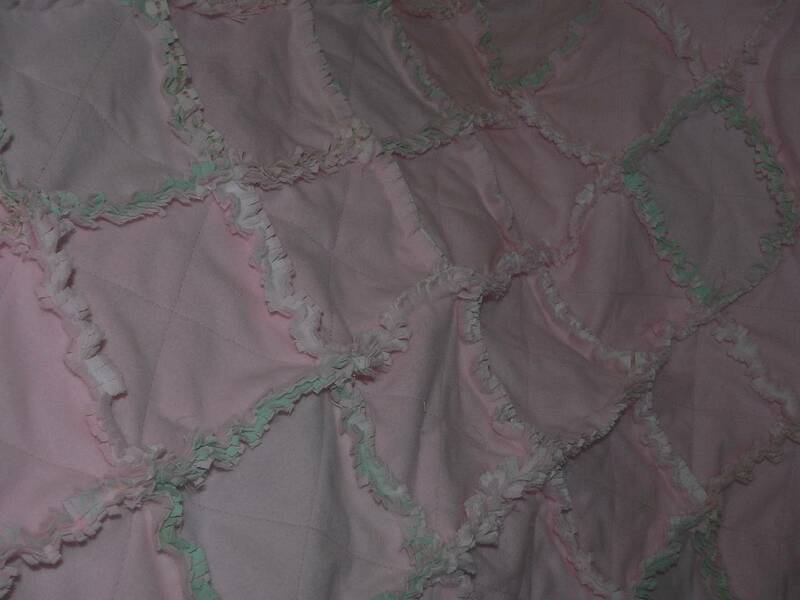 Pink rag quilt after clipping, then shaken hard. If you look at the labels on the right and scroll down, you will see one which is titled "Sewing: Rag quilting". Click on it, you will have five blogs about the subject. 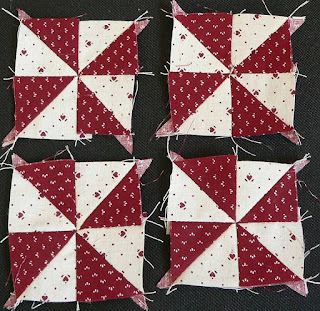 There are instructions, where you could pick up and do it yourself even if you have never done any quilting (piecing). I am sure on Youtube there are many tutorials, and the internet is filled with blogs on the subject. My Daughter told me her BFF was pregnant. I immediately asked her if she wanted a "Shaggy" for her baby. It was a resounding yes. I can't tell you how many of these I have made for infants, big kids and adults (over 100). They are the ultimate "CUDDLE COVER". They wear like iron, go through zillions of washes, only getting softer each time. They are not treasure quilts, even though I know they are treasured. A shaggy can be made with all sizes of flannel squares. The original pattern made the scene in the 90's. 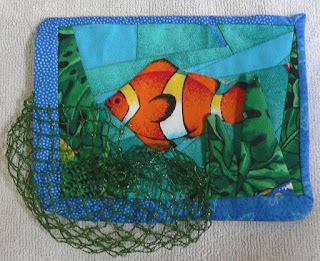 It was made with 8 1/2 inch squares stitched together with 1" seams, and clipped with 1/4" wide ragging, and had 6 1/2" square batting inside. 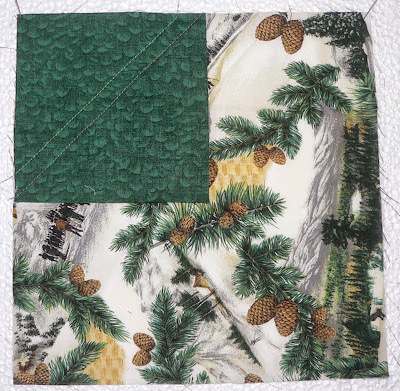 I have 6 inch squares leftover from the previous rag quilts I made. I had enough coordinating squares to make an infant quilt. 180 makes a rectangle, and 200 makes a square. What did I find? It is nice to have a stash of precut squares. You can dive in right away. I was reminded what fun they are to make. It is totally mindless sewing. You don't have to worry if you get a crimp in the seam. Why, it's unwashed flannel and when washed, it will tighten up, the crimp will join the multitudinous wrinkles. On this quilt I used 1/2 inch seams and clipped 1/8" and closer for the ragging. I found this gives a chenille look after washing. 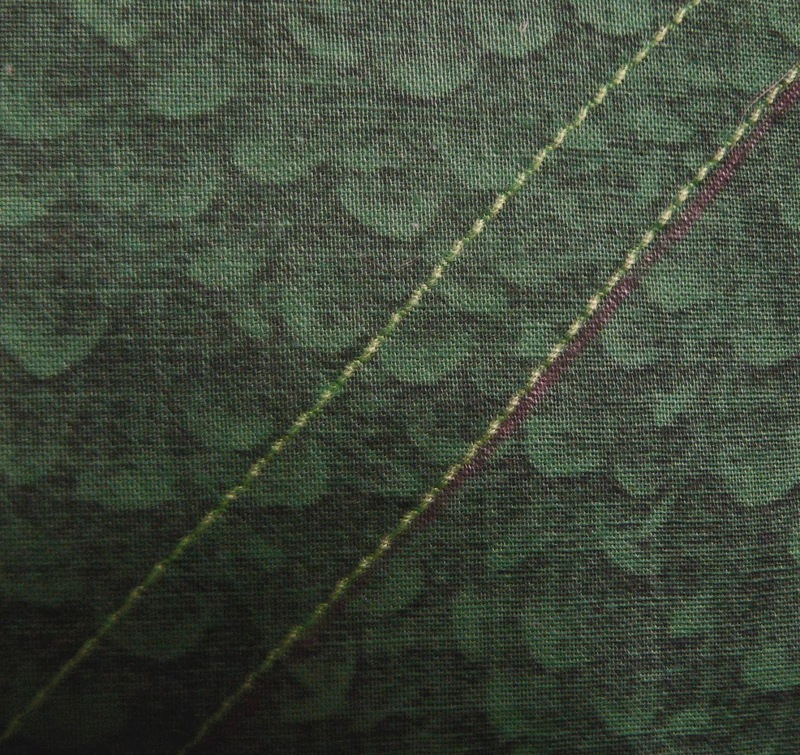 The larger seam with larger spacing of clipping gives the "rag" look. Remember this back is made from leftovers. It isn't a planned back. When choosing colors I have found using the same color in all squares on the side you have your exposed seams is very pleasing. I pick fabrics for the back which complement the front color. (You can make a checkerboard on the back.) When clipped the colors show on the front in a pastel version of those on the back. In my blogs are several examples. Most versions have batting in between the squares. 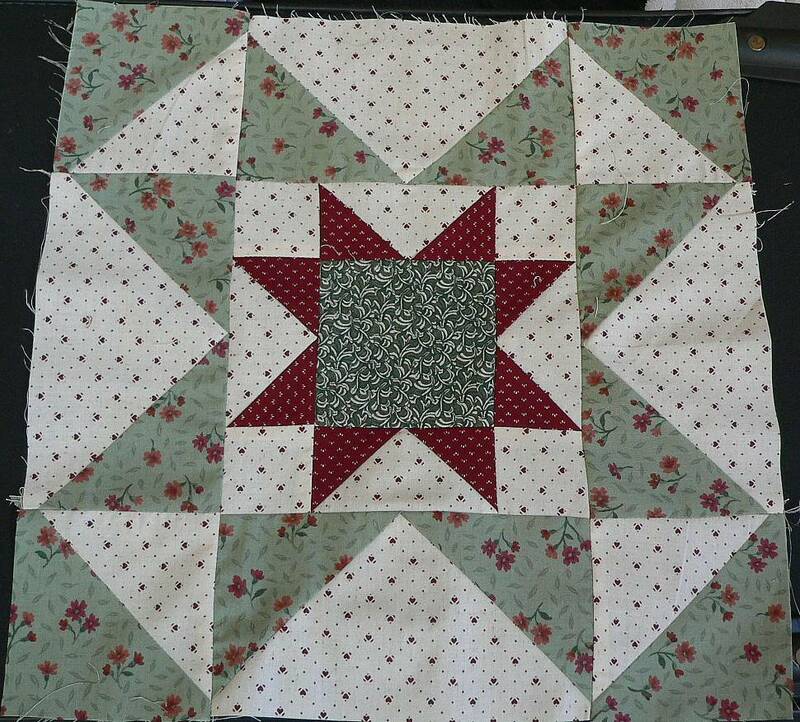 The quilt which I am making for DD's friend is going to Florida so it does not need batting. When joining the squares, you stitch across the diagonal of the square twice. I use the number 3 setting on my machine for for stitch length. It is not necessary to have close stitches here because this is not a stress point. 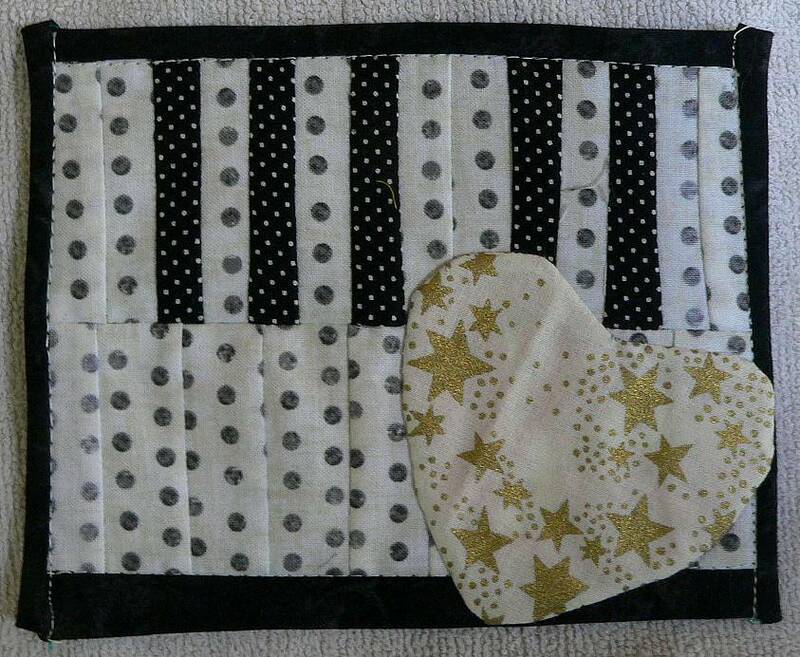 The stitching is to keep the squares together and to hold any batting in place. You can use thread colored different from the fabric. It makes a great accent on the blocks. The quilt looks like you quilted it on the diagonal when you finish joining all the blocks. BTW, I am not a thread snob, but I encourage you to only use new thread. Thread from granny's sewing box is not strong enough for these seams. Very important, before clipping, sew around the entire perimeter with #2 stitch or less. 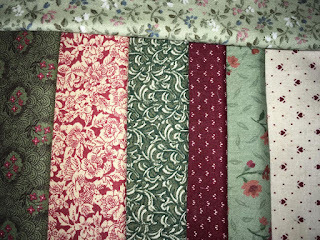 Make this row of stitching 1" in, sew parallel to the edge completely around the quilt. When Stitching the seams I use #2 length. The seams take a lot of abuse when they are washed because of the weight of the flannel. When you are washing it the first few times you should take it outside to shake the "S" out of it. This wet shaking is very stressful on the joinings of the blankie and on you! Believe me when I say, this moment is when you wished you hadn't made a king size with cotton batting. A word of caution: Wash the quilt at the laundromat with several towels. The lint will stop up your front loader very quickly. When you sew a cross seam it is a good idea to bar tack at every crossing. This is where you are going to get real stress in the everyday use. It is almost impossible to repair a seam which splits open after it has been washed. I have done it by straightening the ragged fibers with the iron, and encasing them in the clear packing tape and then sewing on top of the tape. The quilt above won't be washed till next week. I'll post a pic after. You know how we inherit stuff. At the time we don't know what to do with it. We usually end up pitching it, donating it or putting it in a box in the basement for our children to deal with. Which is what we did with boxes of stuff when we lost relatives. Recently I opened one of those boxes and it contained wallets, glass cases, pill boxes, and other stuff that was usually the contents of a lady's purse in the sixties, seventies and eighties. At the time I was delving in the box my cell phone rang. When I hung it up I sat it down on my right , next to one of the glass cases. When I went to retrieve it I realized it would probably fit in it. Voila! it did, and it also fit in all but one of the cases. Looking in the photo you can see I am very hard on cell phones (the outer case has long since bit the dust) and you see the protective clear shield is cracked and peeling off. I tried it on the phone and it slips neatly in my pocket, protecting it's contents. 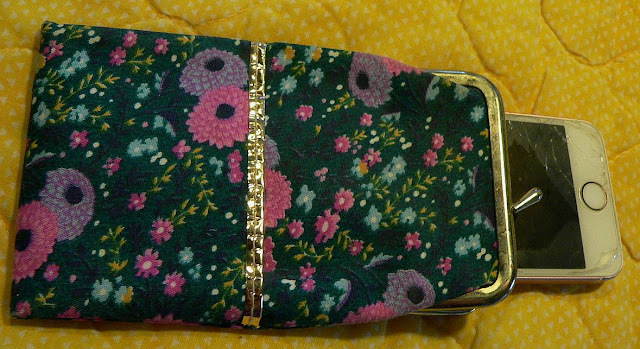 The cell phone made a trash into a treasure, keeping it out of the dump. "recycle - re use"
My hand piecing was on a limited basis before I met my internet Australian Friend Jennie. The picture on the right is of a grandmothers flower garden which I began and then became disenchanted with. I used bits of clothing which showed no signs of wear or fading. This was what I decided would be my criteria. When I make quilts of my own design I set parameters to follow. They are guidelines which can be broken (It's my prerogative to change my mind, LOL). The GMFG was my first foray into hand piecing. I found a pattern in a book of quilts made in the 1800's. The hexes were 3 1/2 inches. I thought, "Great, the quilt will go together fast." As I worked on it, it did go together quickly, but I wasn't impressed. I hadn't wanted it to look like all the other GMFGs I'd seen. I wanted it to look like a pasture with the flower blossoms strewn all over in mass confusion. 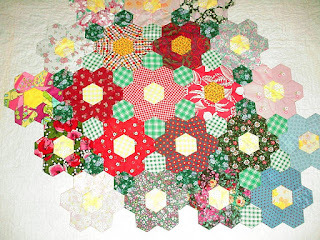 Well, it does, but it doesn't have the charm of the older quilts made with the tiny hexes placed in an ordered design. I have about 4 feet square completed. There are another 20 + finished flowers waiting to be attached. The suitcase has found a spot in a forgotten corner. Maybe It will be brought out some cold winter's day (when Hell freezes over). 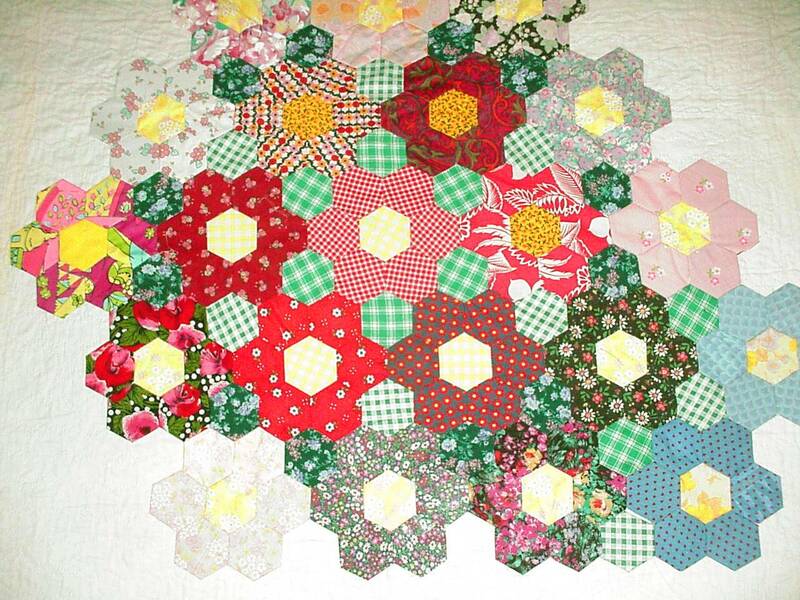 Grandmother's flower gardens are hand pieced but not the traditional way. 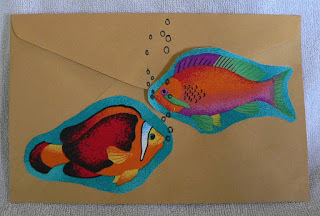 Mine was pieced with templates made of ex ray film and cardboard pieces. You leave them in until each hex is totally surrounded then you pop the enclosed hex out. You whip stitch the units together. Hand piecing with a running stitch provides no difficulties but there is finesse involved. You can sit and sew willy nilly but the following Tutorial says it better. The information contained in it, is the same as taught to me by my friend Jennie when she was visiting in the USA. Jennie and the quilt she made for her daughter, Jess. It is totally hand pieced and quilted. Jennie never used a sewing machine. She could hand piece as fast as anyone could machine piece! Every time I hand piece I remember my times with her. Jennie's Birthday would be coming up January 4th. The world lost her to Breast Cancer. I am currently working on this quilt top while watching the "Cardinal's" Baseball. (With a few movies interspersed). I don't use a lot of pins and if I do use pins I use the thinnest I can find. I do not stitch into the 1/4 inch seam line. I back stitch at the beginning and the end of each seam. If the seam is over a 2 inches, I back stitch every inch. When I come to seams I have to cross, I do not stitch through all layers, I lift the seam "flap" and sew under it through the seam. When choosing fabrics, overly starched fabrics and fabrics with painted designs are wickedly hard to stitch through. This makes the enjoyable hand piecing process, tedium ad in-fi-ni-tum. 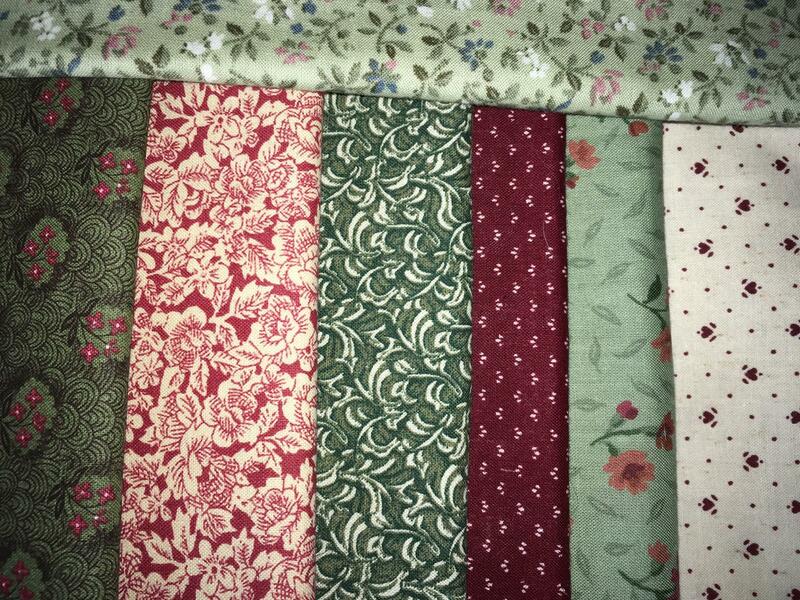 I have an extensive stash of older fabrics and I want to say hand piecing with fabrics older than the fifties is a lot easier than piecing with the current days fabrics. This is because the fabrics weren't as closely woven. 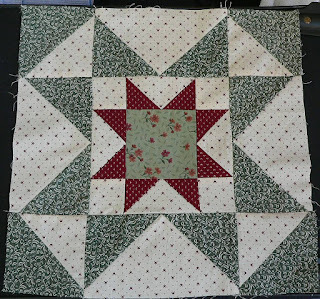 A reason hand piecing with fabric from used clothing is easier is the washing softens the fabric making it a breeze for the needle to glide through. 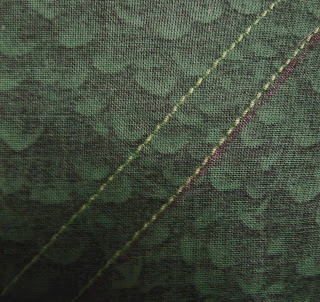 (BTW...in my opinion '60/'70 fabrics are usually horrendously over starched). My time working on these hand projects are "Borrowed Time" which I normally would not have a record of. These quilts are a journal of the time I relaxed, Time I borrowed from the fast pace of our life. Blogs about our pair of pitbulls. It has been a long time since I posted. The garden and life kept me away. Our guild is having their yearly Challenge. This was the impetus to get me back to the sewing machine. It is called the "4 Seasons Challenge". All the guild will be participating. 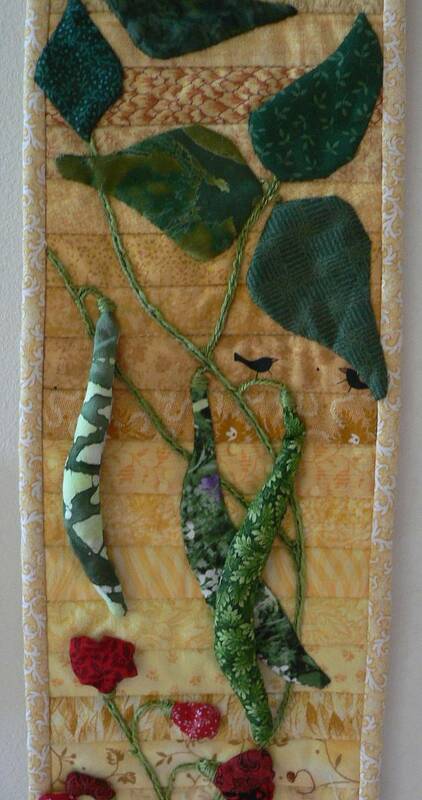 Finished wall hangings will be hung at our vendors fair. If all do the challenge, that will be approximately 120 wall hangings, It will be quite a special display. We were given instructions, on it was specified which season was ours. Mine was summer. 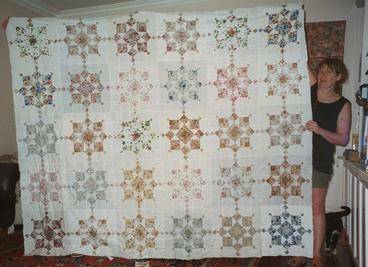 The finished size of the Challenge is 6" wide X 42 inches long. You can use any quilting technique. The Edges are to be finished either with a binding or pillowcase technique. Must have a label with your name. The seasons colors are: Winter teal, Spring lime green, Summer yellow, Autumn orange. Your season is highlighted. Due date is September meeting. They will be used to decorate the hall for our Vendors fair in October. On the left is my Summer Challenge. The minute it was announced I knew what I wanted to do for the background. I love pieced backgrounds. I drew a full size rectangle on butcher paper and looked at it for 2 months. Total brain block, no ideas. I decided I would make the back ground. I was given the yellow card, I headed to the yellow stash. I am making a progression from the lightest to the darkest/brightest yellows. I cut 6 1/2 X 1 1/2 inch strips, sewed them on muslin which was marked with the 42 X 6 rectangle. I used the stitch and flip method. I looked for inspiration as I stitched each yellow in place. I imagined the background to look like the sunlight when it is almost noon. I finished the panel. I used 48 strips not 42 to complete the banner. Why, I still haven't figured out. Maybe my 1/4 inch wasn't right. It didn't matter since I was making a piece of fabric to use for my background. When I finished I still wasn't inspired. 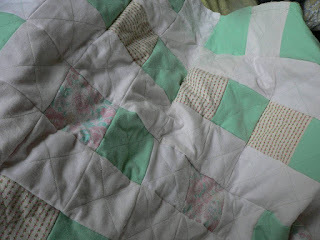 So I sandwiched it with batting and backing, and quilted it. I did "Stitch in the Ditch". Finished that and still no inspiration. Trimmed it and added the Binding. I'm still foggy about what to do with this very skinny looking table runner. (Which by BTW would be a very good use of scraps...just make it larger.) While Binding I realized that I could turn in the Banner just as it was. It was a pieced piece. It could be named "Sunshine on my Shoulder". Which is a very summery theme. Between bouts in the garden, I peruse seed catalogs. 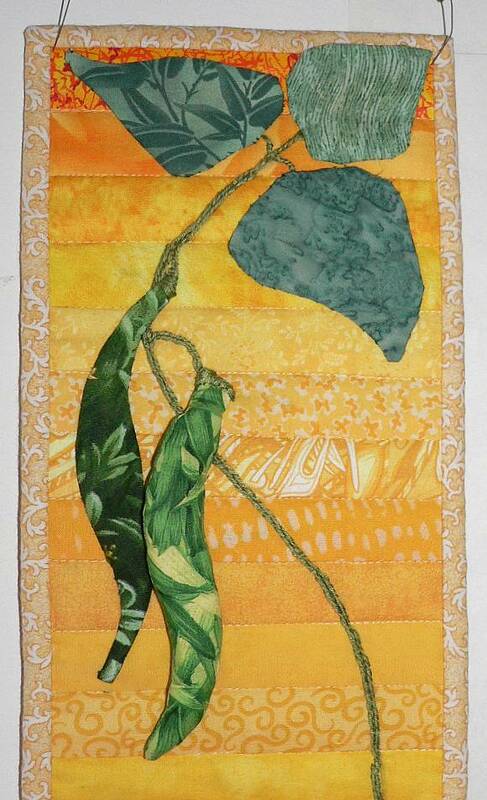 I came across the picture of scarlet runner beans and Voila, there was my inspiration. I searched the stash to see if there were greens for leaves and beans. I removed the paper with the rectangle from the wall and began drawing my pattern. The picture on the left is my design for the banner. "TIP":You can see a little bit of Painters Blue tape. A roll resides in my sewing desk. I use it to hang every thing from this paper pattern to fabric. It doesn't make things tacky and I can re position the hung object where ever I want. and BTW, it will also peel off paper if you do it gently. "TIP" 2: I save any size cardboard rolls. Toilet paper ones are good to roll 6" items on. When I hand piece, I have rows of blocks or sashings, I roll them on tubes and put them in a baggy till I join them with other rows. This keeps them clean and crease free. Another advantage is the finger pressed seams stay pressed when they are rolled around a tube. Paper patterns, I wish to save, I roll on larger tubes. 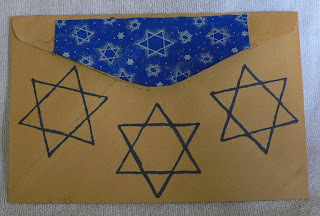 It does take more room, but the patterns don't have fold marks. 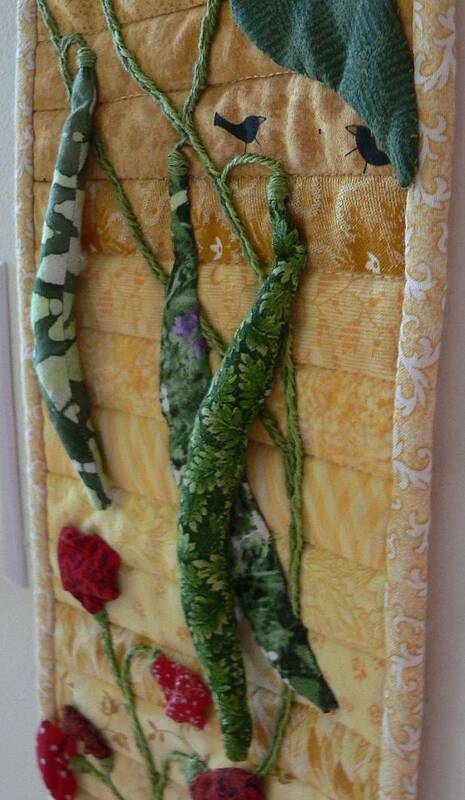 The quilted background was rolled on a tube while I worked on it until I began putting the 3D relief items on it. I'm ahead of myself, The next problem I needed to address was how to transfer the pattern to the background. HOW DO I GET THE PATTERN ONTO THE ALREADY QUILTED BACKGROUND? This involves another tip which I thought up on my own. It may have already been used and reported on the internet but I hadn't seen it. Let me revel in the delight of my discovery. My friend mentioned I could use contact paper and the light bulb went off. 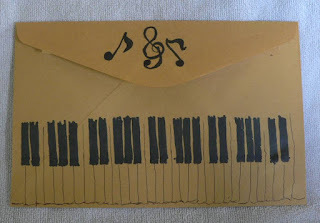 I couldn't use carbon paper to draw the design on the background. It would smudge. I couldn't free hand it, and if I tried, I wouldn't be able to erase any mistakes I made drawing it from the fabric. I couldn't use a light box because I had already quilted it. 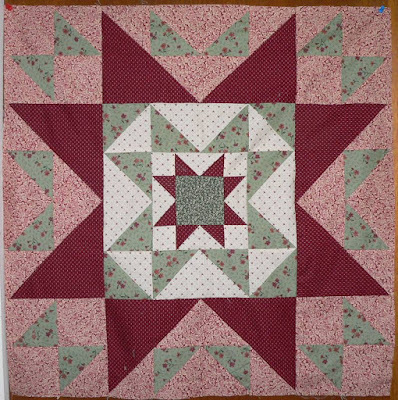 It was essentially a finished "Quilt". My friend said to copy it on contact paper and use it to position items. I was concentrating on how to get the basic vine onto the fabric. Bingo, I remembered "Press-n-seal" plastic wrap. I had bought some to use to draw quilting patterns on and stitch over. This idea I had gotten from a friend on the internet. I had never done it but I had the box of the stuff. I had my husband help me stretch a piece down the length of the paper pattern. I smoothed it down and it stuck! I'm getting excited. It was working. I took a Sharpie fine point and traced the major vine and its branches on it. I also traced the rectangle's outline on the "press n seal". We then peeled the plastic off which was more difficult than it sounds. The plastic when pulled off wanted to stick back on itself like saran wrap does. Using the press n seal on any piece bigger than a sheet of paper is a two person job. The quilt was laying on a flat surface and we proceeded to stretch the plastic over it and fold the excess to the back of the quilt. It took a mighty amount of smoothing and stretching and smoothing again to make it respond and lay flat. There were a few minor wrinkles but that didn't distort the design. press hard because the ink would bleed through on the fabric. I decided to try in the bottom right corner, where the vine ends, to slit the plastic on the line and trace with a #2 pencil and see if it is light enough not to show through the embroidery. EUREKA! I was on my way to a Banner for summer. The rest is history. I made another copy on new plastic with the leaves and flowers included. After I finished the embroidery of the vine I covered the piece again with plastic wrap. This time it would only be cut across the middle. This would allow me to place the leaves and flowers where they should be. I copied the leaves beans and numbered them. Cut their patterns out . The beans are just stuffed tubes. The flowers are weird shapes which I stitched as if I was making yoyos and gathered them up and shaped them in the semblance of a bean flower. While I was working on the piece the rest of it was covered with the plastic wrap. I only uncovered the area I was working on. The plastic wrap scores again. It kept my project pristine from pet hairs and all sorts of debris. I hope everyone takes advantage of a Challenge when it comes your way. Don't think you can't do it. Or that your abilities are not up to it. It is so rewarding to have those "VOILA" and "EUREKA" moments. Where I have stories of my cats and other petsa blog about my courtship with my husband,and a blog about my most embarrassing moment. A "Soap box" blog where I do air my opinions.